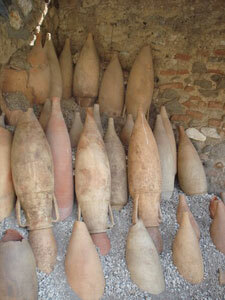 Garum was a popular fish sauce condiment. It was made by the crushing and fermentation in brine of the intestines of fish such as tuna, eel, anchovies, and mackerel. Because the production of garum created such an unpleasant smell, its fermentation was relegated to the outskirts of cities. The finished product was quite mild and subtle, and was mixed with wine, vinegar, pepper, oil, or water to enhance the flavor of many dishes. Garum is similar to fish sauce used today in Thai and Vietnamese cooking. Robert Curtis, one of our project's Principal Researchers, has published the book Garum and Salsamenta: Production, Commerce in Materia Medica, providing a province- by-province survey of the areas which produced and exported fermented fish products. This study explores an important facet of the Roman economy having continuity with the modern world. Benedict Lowe, another of our Principal Researchers, has also published scholarly treatises on the trade in preserved fish sauce and ancient economies. 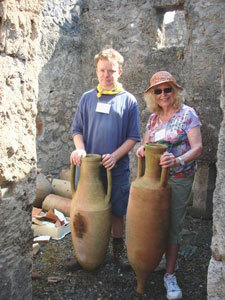 GARUM: Pompeii was famous throughout the Roman world for producing and exporting a spicy fish sauce called garum. Here are some recipes for this culinary treat. Use fatty fish, for example, sardines, and a well-sealed (pitched) container with a 26-35 quart capacity. Add dried, aromatic herbs possessing a strong flavor, such as dill, coriander, fennel, celery, mint, oregano, and others, making a layer on the bottom of the container; then put down a layer of fish (if small, leave them whole, if large, use pieces) and over this, add a layer of salt two fingers high. Repeat these layers until the container is filled. Let it rest for seven days in the sun. Then mix the sauce daily for 20 days. After that, it becomes a liquid. Chop small fish into tiny pieces. Add fish eggs and the entrails of sardines and sprats. Beat together until they become an even pulp. Set mixture in sun to ferment, beating occasionally. 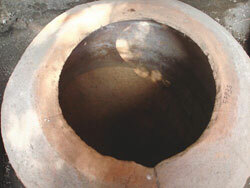 Wait six weeks or until evaporation has reduced the liquid content of the pulp. Hang reduced liquamen in a basket with fine holes in the bottom. Place storage jars under the basket. Let liquid slowly drain into the jars. Collect the liquid in the jars. 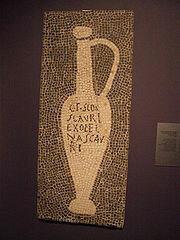 This is the garum. Note: Use garum sparingly. It is a strong sauce with a strong smell! Note: Do not substitute fresh herbs with dry as they will not puree properly, either omit, experiment with other fresh herbs, or increase the amounts of parsley.